On Sale Now! 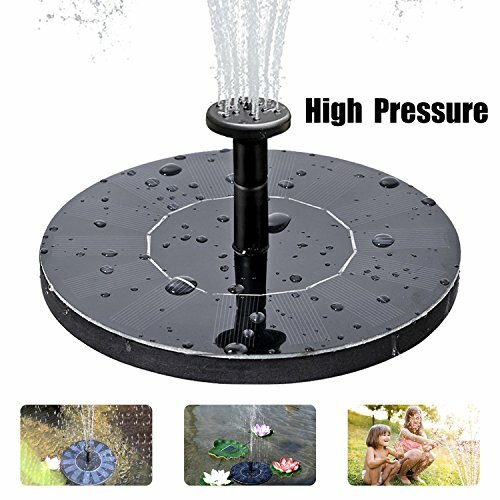 Save 8% on the Solar Fountain Pump, Free Standing Solar Birdbath Fountain, 2018 Upgraded 1.5W Solar Powered Fountain Pumps Submersible Outdoor, for Bird Bath, Small Pond, Swimming Pool, Garden, Patio and Lawn by CYNOVA at The Net Stores Network. MPN: SFMB01. Hurry! Limited time offer. Offer valid only while supplies last. Product Introduction: Solar fountain pump consists of highly efficiency pump and solar panels. 1.Assemble the product according to the sketch map. Product Introduction: Solar fountain pump consists of highly efficiency pump and solar panels. 1.Assemble the product according to the sketch map. 2. Put it on the water. It works continuously as soon as the sunshine is enough. When the sunlight is weak, water pumps may not work continuously, once sunlight is stronger it automatically works continuously. The water height is depend on the sunlight strength. The pump is driven by the sunlight. Please adjust the angle of the panel and make the sun hit it. It will work continuously when the sunlight is enough. Besides the sunlight, the pump is also affected by weather, seasons, places, etc. Clean the pump regularly. If it's dirty the solar fountain for birdbath will stop working. The packing contains small parts so please keep them away from children and pets to avoid danger of suffocation. Don't run the solar bird bath fountains without water for a long time, or its lifespan will be shortened. If for any reason you are unhappy with this product, please feel free to contact us. We take full ownership and responsibility for the quality of our products and will do our very best to solve your problem quickly and efficiently! 【Upgraded Solar Fountain Bird Bath Pump】It runs by solar, no battery or electricity needed. Get the fountain floating on the water (approx. 2 inch. Depth at least), then it runs automatically in 3s when there's sunlight exposure. 【New upgrade】With higher efficiency Brushless Pump and 1.5W solar panel, stronger power and better water spraying. It works even without FULL sunlight, no matter in low sun exposure, or partial shade over the solar panel. 【6 Nozzles】This solar water pump kit with 6 Nozzles allowing you to choose different water patterns at will. Or you can take off nozzles from the solar fountain pum to prevent water splashing out. 【Multi-Application】Perfect for outdoor birdbath, fish tank, small pond, bird bath for garden, swimming pool, water circulation for oxygen, increasing the pH of water, etc. 【After service】100% product satisfaction guaranteed, 1-year warranty. Suggestion: Make sure you have put enough water in the fountain so that the pump can stay entirely under the water. Please clean the pump on regular basis to avoid the pump get blocked with dirt. If you have any questions about this product by CYNOVA, contact us by completing and submitting the form below. If you are looking for a specif part number, please include it with your message.